It's Secret Recipe Club time again! This month I was assigned The Spiffy Cookie written by Erin. I just love Erin's blog. There were so many recipes I wanted to try like Maple, Walnut and Flaxseed Pancake Doughnuts, English Muffins and Baked Blueberry French Toast with Streusel Topping. I even had my mind made that I was going to make the Baked French Toast but as I was thinking about what to make for dinner I realized I had once again had forgotten to pick up roti at the grocery store. Then I remembered Erin had a recipe for Whole Wheat Pita! Pita has been on my list of things to try and this was the perfect time! They turned out really good. Hasan and Bilal had some for lunch with hummus. These are pocket pitas which was perfect to spread the hummus inside to make it easy for them to eat. I also used the pitas to make them a quick pizza and they loved that too. Hasan declared that they were "Excellent!". Of course they also tasted great along side some Indian food. The only problem I had (as with all yeasted baked goods) is the waiting time for the dough to rise. It wasn't a problem this time since summer holidays have started and I'm not rushing around. Regardless this recipe is definitely a keeper! Thanks Erin for sharing such a great recipe and I will be back to try out some more. Next on my list is Pancake Doughnuts! In the bowl of an electric mixer, whisk together yeast, flours and salt. Using the paddle attachment, on low speed add honey, olive oil and 1 1/4 cup water until dough comes together. Add more water as necessary. Switch to dough hook and knead on low for 10 minutes. Transfer to a lightly oiled bowl and turn to coat. Cover with plastic wrap and let rise until doubled in size, about 90 minutes. Once the dough has risen, punch down and divide into 8 balls. Cover with a damp kitchen towel and allow to rest for 20 minutes. On a lightly floured surface, roll out one ball till it is 6 inches in diameter. Transfer to a piece of parchment paper. Continue with remaining 7 balls. Allow to rise for 30-40 minutes or until just barely doubled. While the dough is rising preheat oven to 450 F with a baking stone or overturned baking sheet placed on the middle rack. Add as many pitas as you can fit on the baking stone/baking sheet. I did 3 at a time. Allow to bake 3-5 minutes. I have always wanted to try pita, maybe this will be "the" recipe! These look great! I've always wanted to make homemade pita. I wanna participate in these "post a recipe" things also. How can I? I'm a bit novice ya know. Btw are these pita breads really this puffy, so can we like stuff them with chicken and salad and all that creamy stuff, huh, huh, huh? To join head to the website: Secret Recipe Club. You can fill out the form to join but there is a waiting list (don't know how long it is). When the pitas are baking they puff out. When you take them out of the oven they are puffy but then slowly flatten. You can stuff them. I put hummus inside for my kids to have for lunch. There is nothing better than homemade fresh pita! Great SRC choice! I'm so excited that your tired this recipe! I recently made them again and was re-reminded how much I enjoy fresh pita. Glad you stuck it out on the rise time. Your pitas are gorgeous! Great job and a wonderful SRC choice. Beautifully puffed up,lovely wheat ones! Homemade pita is so much tastier than store bought. Looks delicious! I've been wanting to try my hand at pitas for a while now. Your look beautiful! Great job!! Mashallah, your pitas have puffed up so perfectly. Wow, I love how light and puffy your pitas came out. Great pick for SRC! Great choice for SRC! 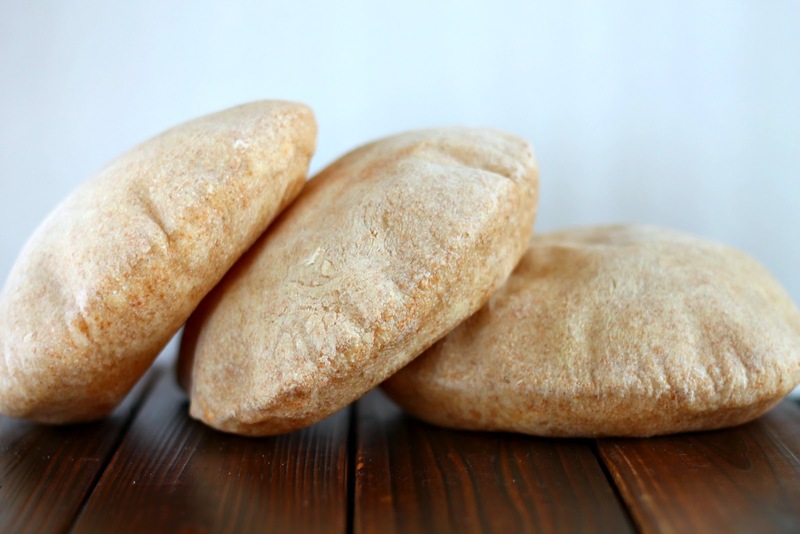 I have been meaning to try to make my own pitas and I love that this recipe is for pocket pitas, great for stuffing lots of yummy things inside! your pitas looked like they turned out absolutely perfect - hooray! i love homemade pita - aren't they such fun to make? i love seeing 'em puff up in the oven! Oh I love homemade pita but it has been months since I have made any. We enjoy ours with hummus too along with a little tabouli. I love being a new member of SRC, look forward to sharing!!! wow. they puffed up so nicely. Pita bread is perfect!! love the pics! pls visit and join my space in your free time..
i've always wanted to try to make pitas... these look so easy. super choice for SRC! Wow! I've been wanting to make pita with whole wheat but wasn't sure how it'd turn out! You achieved great results! I'll give your recipe a try soon. Your pitas look fantastic! Love the huge pocket you got. Mmm, homemade bread is incredible. Your pita looks like it came out perfect! Wow - I have never made homemade pitas. I truly need too, these look incredible. I've never made my own pitta - this looks all puffed up and delicious!! Will have to give it a go. Great SRC pick! How lovely! I love pita and these look relatively painless to make! Asiya..These are lovely! I will definitely be making them. Thanks for the inspiration!